Copenhagenize.com - Bicycle Urbanism by Design: Save The Street With Bicycles! Save The Street With Bicycles! Just when you think you've seen it all, you inevitably see something weird. I was sent a link to a Facebook group called Save H.C. Ørsteds Street! A street in Frederiksberg - the neighbourhood in which I live - is under attack, one would assume. The small businesses in the street started a group to raise awareness about it and they all blacked out their windows in protest, as you can see in the photo above. Now this being Frederiksberg, in the heart of Copenhagen, it wouldn't be surprising that you'd assume that some evil plan was underway. Something that would jeopardise the quality of life here in Denmark's most densely-populated neighbourhood. What, pray tell, could this Imminent Threat be? Dare we ask? Um... it's bicycle infrastructure and traffic calming. Believe or not, once in a while we do still experience minor protests regarding changes to the traffic situation. There aren't many streets left in Copenhagen and Frederiksberg that don't have separated bicycle infrastructure. 35 odd years of implementation of cycle tracks - a great many kilometres running past shops - and yet there is no documentation that it is a negative thing. On the contrary. The benefits are massive for shop owners, local citizens and the quality of life in a neigbourhood. We know this in Denmark and they know it in the Netherlands and other European countries. We've known it for more than three decades. I want nothing more than for the small, lovely shops on H.C. Ørstedsvej - between Thorvaldsensvej and Rosenørns Allé - to thrive, profit and continue to contribute to life in this wonderful neighbourhood. It's hard to figure out what they want. The redesign of the stretch will remove some car parking and, apart from cycle tracks, the road will be traffic calmed by creating a dog's leg to slow down the cars. Most of the blacked out shop windows read "No Car Parking Means Shop Death!" Although some said that they supported bicycle infrastructure, just not removing parking. When all you have to go on is vague perceptions and ideas, without any knowledge, your message is going to be vague. So I'm going to do two things. I'm going to highlight why they are dead wrong and then I'm going to tell them how to increase sales. First of all, they are basing their protest on perceptions, and nothing more. I joined their Facebook group and asked nicely for their documentation. One of the women said they didn't have any and furthermore, they didn't need any! "Of course you can protest without numbers and facts - just look at Nørrebrogade, Blågårdsgade and Gammel Kongevej, all of which have been thriving shopping districts. I don't think anyone has gone to the trouble of making numbers and facts in fancy reports, but the business association on Nørrebrogade has said that their business dropped between 50-80%..."
Firstly, the reference to Nørrebrogade is far-fetched. The redesign of that street coincided with the global financial crisis. Shops in all neighbourhoods experienced a drop in earnings and using the widened bicycle lanes and car-free zones as an excuse was regarded as weak and irrelevant. Not to mention lacking in credibility. The people who actually live in the neighbourhood and use the shops supported the redesign of the street with a massive majority. They wanted a nicer place to live and shop. What is most frustrating is that this reliance on perception, instead of facts and figures, serves little purpose. You would think that these shop owners would do research before starting a campaign. Most information is readily available on the internet. I've found the necessary numbers and facts today - although I have a number of documents on my computer already. They're wrong because removing car parking, calming traffic and putting in cycle tracks will NOT result in "Shop Death". There is no documentation supporting their claims. There is, however, plenty of documentation to show that things are going to get better for the shop owners and the neighbourhood. Shop owners have a tendency to overestimate the transport forms their customers use to get to the shops. That they overestimate it here in Copenhagen and Frederiksberg is beyond me, but hey. 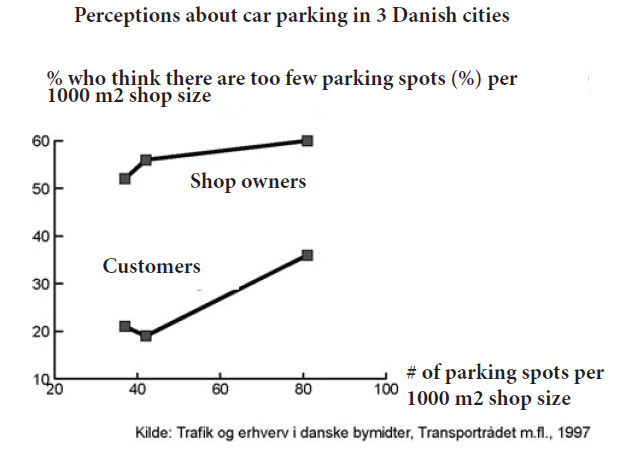 Here's a graph from three Danish cities showing that shop owners seem to think there are far too few parking spots but that the customers don't agree with them. 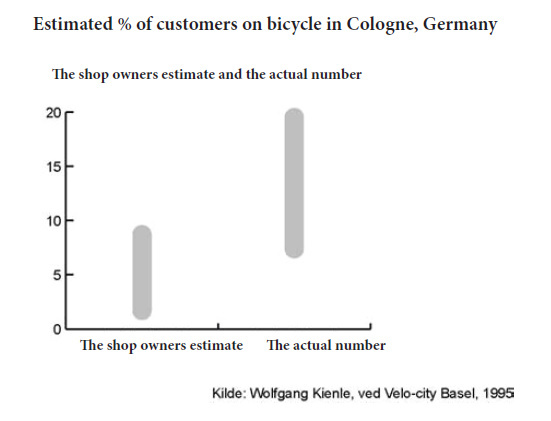 Here's a graph from Cologne (Köln) showing that shop owners are way off in estimating how many of their customers arrive by bicycle. You may recall that IKEA here in Copenhagen were suprised to learn that 25% of their customers arrived at the big box stores by bicycle or public transport. Here's how they reacted to THAT news. Here is a graph from Oslo showing that earnings from customers are pretty equal - interestingly motorists who park in nearby streets spend more money - I'll get to that in a bit. But, again, shop owners are way off in guessing what transport form their customers use to get there. So let's look at some numbers regarding cars. H.C. Ørstedsvej is in a neighbourhood in the city of Frederiksberg. So what about the car ownership levels here? - 63% of families in Frederiksberg DON'T own cars. That's a lot of people who won't really be bothered about fewer car parking spots. - Furthermore, car traffic has fallen 3% since 2009 and this trend seems to be continuing. 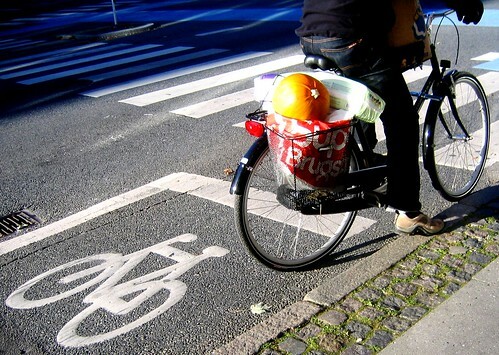 - Virtually everyone in Frederiksberg has a bicycle. - 36% of the population use a bicycle to get to work or their place of education. H.C. Ørstedsvej runs roughly between two neighbourhoods in Copenhagen - Nørrebro and Vesterbro - which could easily be considered catchment areas for these small shops. What about car ownership in these places? - Nørrebro has the lowest car ownership in the nation. There are only 129 cars for every 1000 citizens. - Vesterbro is low, too. Only 137 cars for every 1000 citizens. - The average in Copenhagen is 169 cars for every 1000 citizens. That means that 70.9% DON'T own cars. What about traffic volume in the neigbourhood? - There are 6500 bicycles on the street each day. The street doesn't lead to the Copenhagen city centre, where most bicycle traffic goes to and from, but on the two streets that flank H.C. Ørstedsvej: 4600 cyclists on Nyelandsvej and 7690 on Godthåbsvej. There are no numbers for Thorvaldsensvej from the City of Frederiksberg but we estimate that the number is between the two previous ones. - Being a densely-populated neighbourhood, pedestrian traffic is considerable, as well. Just looking at those numbers - who could possibly be worried about removing car parking? Ah... but then there is still that nagging misconception about "cyclists". 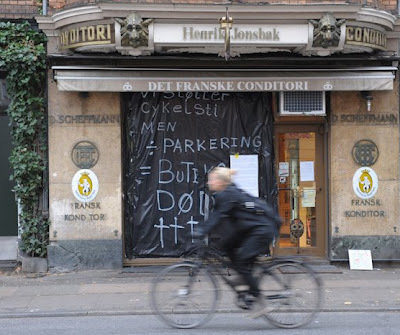 Even in the heart of Frederiksberg - in the heart of Copenhagen 'The City of Cyclists', bicycle users don't seem to be taken seriously by these shop owners. Let's mythbust, shall we? 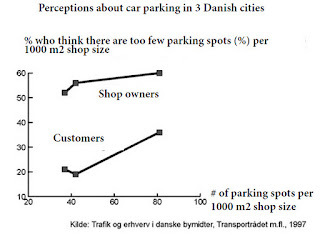 First of all, the ever-popular blogpost here on Copenhagenize.com Cyclists Are Better Shoppers Than Motorists is worth a visit/revisit. Loads of stats for shop owners and bicycle advocates. Here's how people get to shops related to distance to destination. Walking and cycling are the prime modes of transport for trips under three kilometres - which certainly applies to the shops on H.C. Ørstedsvej. And it's a national statistic so you can bet it is even rosier in densely-populated neighbourhoods in the cities. In Breda, Netherlands, they learned that while cyclists spend less per visit than motorists, they visit shops more often and therefore are bigger spenders than motorists on a weekly basis. The same tendency can be seen in Utrecht, Netherlands. 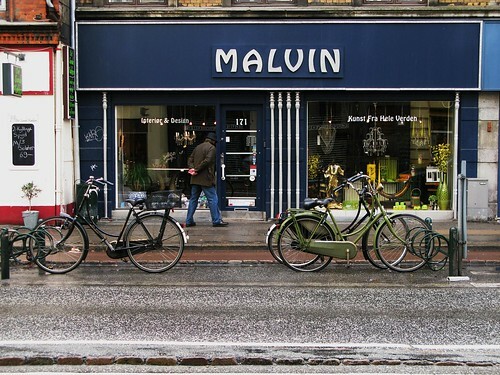 If you are a shop owner in a densely-populated neighbourhood in Denmark - or anywhere really - and you want to not only survive but also make a good living out of your business - embrace the bicycle user and the pedestrian. 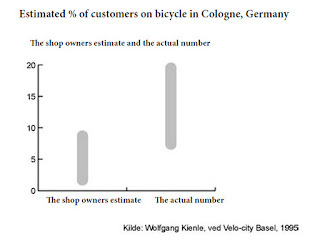 Cyclists are also more loyal to the small shops in their neigbourhood, as are pedestrians. If you want to create a shopping district that is attractive to visitors and that improves the quality of life in the neighbourhood - embrace the bicycle user and the pedestrian and fight for traffic calming and lower speed limits. - Traffic calming and lower speed limits increase the perception of the street as being a nice place to be. In Berlin, cross-neighbourhood traffic - pedestrian and bicycle - boomed when 30 km/h zones were put into place. - Traffic calming reduces noise pollution which contributes to a nicer neighbourhood/shopping district. - Bicycle lanes (when properly placed along the curb) act as a traffic calming buffer and then also increase the number of pedestrians. The sidewalks are simply nicer to walk along. Pedestrians are a benefit to small shops. Ever heard of window shopping? Kind of hard to do when driving past at speed in a car. - Bicycle lanes - not surprisingly - increase the number of cyclists. 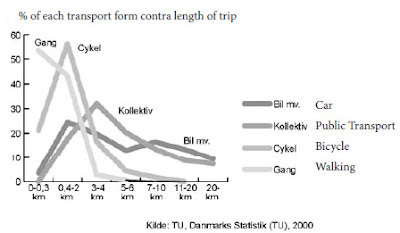 In Copenhagen, when a street is redesigned with bicycle infrastructure, there is as a rule an increase of 10% or more in bicycle traffic. - Bicycle lanes increase property values. Like I said, I want nothing more than these shops in this neighbourhood to rock and roll and thrive. Small shops have a tough time of things and yet they contribute so much to the liveableness of a neighbourhood. What can they do to ensure that this happens? Not least in the midst of a continuing financial crisis? Easy. - If they're going to protest, they should protest that the City of Frederiksberg's plans for the street are simply not visionary enough. 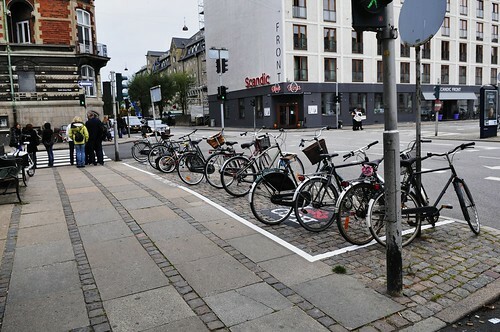 - They should ask for more parking spots to be removed, keeping only loading zones in place for morning deliveries, like in the centre of Copenhagen. Instead of one parking spot for a single-occupant vehicle, how about six parking spot for customers who spend more money, like this one on Gammel Kongevej down the road? 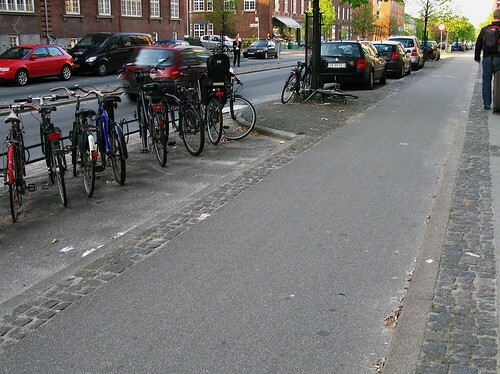 Or even more bicycle parking/traffic calming like these racks on Nordre Fasanvej? Or parking zones like in Copenhagen? - They should lobby for 30 km/h zones. That would add a fantastic sense of niceness to the street and draw even more bicycle traffic and pedestrians - and their wallets - to the district. - They should arm themselves with documentation (see all above) in order to present their case to the City of Frederiksberg. - They could even lobby for making the street a pedestrian zone, with benches and room for markets. People would come from all over the city to shop there. If they pulled THAT off, they would reap the benefits of branding and they'd be famous. The future is bright for the shopping district, but it could be so much brighter.